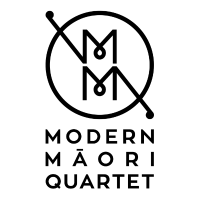 Past Tour: Tour-Makers presented the Modern Māori Quartet in Auckland, Hamilton, Tauranga, Whanganui, Palmerston North and Blenheim in 2015. If you are interested in this show please contact the Modern Māori Quartet. A Māori foursome with a fresh take on classic Māori show-bands. 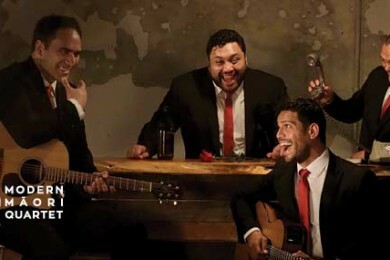 An evening with the Modern Māori Quartet is a celebration of humour and heavenly harmonies. Handsome and well-dressed, they’re all swagger and suave, with a fine sense of comic timing and cheeky charm. 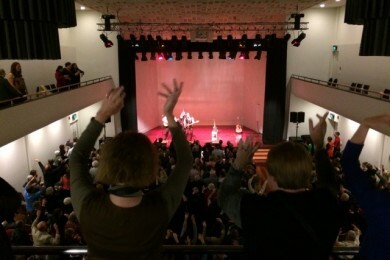 These modern men play homage to the Māori show-bands of old, working the audience with waiata and wit, guitars in hand. 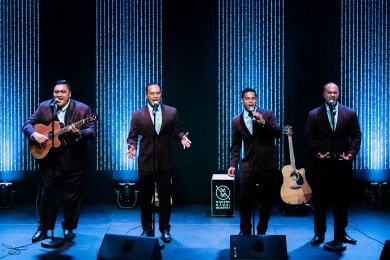 Toi Whakaari graduates James Tito, Maaka Pohatu, Matariki Whatarau and Francis Kora are actors and crooners, who put their own spin on classic and modern numbers, including Lorde’s famous Royales.